This Filbur FC-6010 pool and spa filter is made to match the exact OEM specifications and is compatible with the Harmsco ST/105. Filbur filters are made with Reemay™ polyester filter media, durable polyurethane end caps and reinforced PVC center cores. The filters feature sharp pleat folds to eliminate bridging and allow dirt to penetrate deep into the pleats for better flow and easier cleaning. Perfect for consumer and industrial pool applications. Low Maintenance. 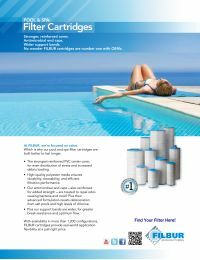 Cleanable & reusable, the FC-6010 Pool Filter Cartridge requires fewer filter replacements, resulting in less hassle and maintenance.